As originally conceived, they do not lend themselves readily to today’s common technology standards and practices: Java, REST, RPC, Web Services and mobile and Web apps — not to mention whatever is coming next. The last point is a principal rationale for the rise of the legacy modernization industry in recent years. Various ways and means of “modernizing” legacy applications have emerged, and these are well-known and well-documented in the industry, and even here in the Treehouse Software blog and its predecessor, the Treetimes newsletter. After a few years of shakeout and consolidation, it would seem that there is little new under the sun in terms of legacy modernization practices and practitioners. But that’s not so. It was back in 2013 when we first encountered OpenLegacy, a new entrant in the field and one with a novel approach. Nobody else in the modernization biz seems to be offering a standards-based, open-source toolkit/platform that can open up any IBM z or i legacy environment to provide Web and mobile interfaces, Web services and APIs—without migrating the legacy application or changing its code. 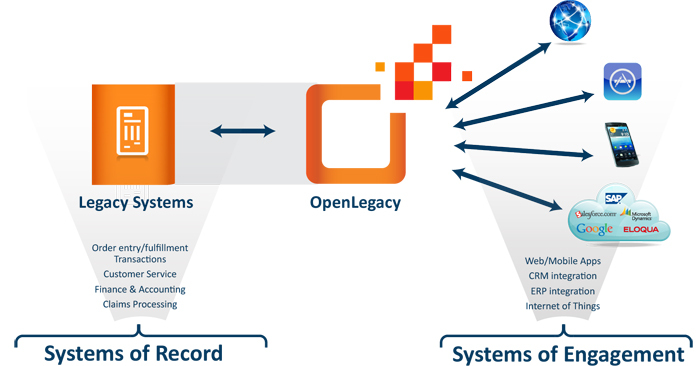 With OpenLegacy, the value of the legacy environment can be fully leveraged in today’s technologies — and in whatever comes next. We’ve been watching the company and its offerings evolve over the months, and Treehouse Senior Software Developer Frank Griffin participated in a technical evaluation and went through OpenLegacy training. We were all pretty impressed—so much so that we recently inked a partnering agreement with OpenLegacy to help market and deliver their solutions in North America. In the post below, Frank discusses one aspect of how OpenLegacy can be used to open up mainframe 3270 applications. Stay tuned for more posts from Frank as our OpenLegacy journey continues. Treehouse Software is now partnering with OpenLegacy to provide access to legacy IBM mainframe applications for a range of non-mainframe devices, including mobile phones and tablets as well as “heavier” clients like Service-Oriented Architecture (SOA) consumers. Unlike many modernization approaches that require a commitment to migrate the legacy application in some way or at the very least require legacy application code changes, OpenLegacy adds more modern potential client populations to the existing application clients with no required changes to legacy code. OpenLegacy is open-source, and is built using standards-based protocols and other open-source components wherever possible. The starter version is free to download, so you can get started with your testing immediately. OpenLegacy can interact with legacy applications in several ways, but for simplicity in this initial post I’ll concentrate on just one: access to 3270-based applications. We’ll assume that you have a 3270 application which can be made to display data required by a non-legacy client by navigating through one or more screens. The data need not all appear on a single screen, but can be spread over several screens. All you have to know is how to navigate through the application to get the data you want displayed. The OpenLegacy development suite runs as a plugin for the Eclipse Integrated Development Environment (IDE) or a self-contained IDE installation, which has several advantages. It allows OpenLegacy to piggyback on the rich GUI which Eclipse provides, and provides a familiar IDE environment for customer developers. 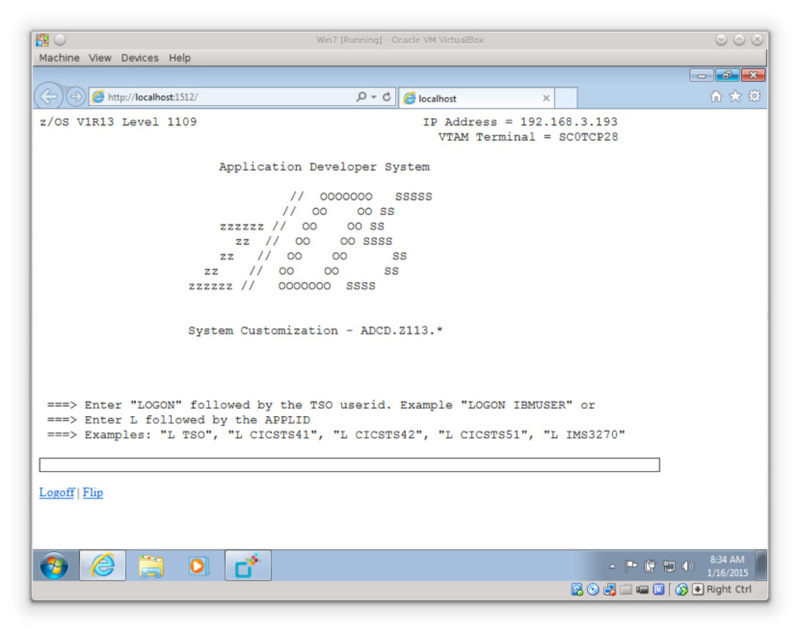 In the upper right, you can see a window with the current state of the 3270 emulator, which initializes at the standard initial logon screen for VTAM applications. In the upper left, you can see the directory structure which is automatically created for you when you use the OpenLegacy wizard to create a project. In project creation, you specify the target mainframe host, so OpenLegacy can open a TN3270 session to that host. Navigation directions are entered by having OpenLegacy open a browser-based 3270 emulator which uses a captive copy of the s3270 emulator to interact with your mainframe system under OpenLegacy’s control. You use the browser-based emulator exactly as you would a 3270 terminal to log on, enter requests and input data, and do whatever a 3270 user would do to get to a screen of interest. However, because the 3270 emulator is running under OpenLegacy’s control, OpenLegacy is recording every keystroke needed for the navigation. The browser application captures your keystrokes and feeds them to the 3270 emulator, also capturing the input and output from the emulator. These traces are referred to by OpenLegacy as “trails”, and are saved as XML files. When your project actually executes, this file is used instead of browser keystrokes to provide input to the emulator and scrape data from the emulator output. When you’ve arrived at a screen containing data of interest, you switch from the browser window back to the OpenLegacy Eclipse GUI, and let OpenLegacy analyze the screen contents, identify the fields on the screen, and allow you to select those of interest and identify them with names and datatypes. This navigation/selection cycle continues until you’ve identified all of the data you wish captured. At that point, you literally just push a button, and OpenLegacy will generate a complete rich web Java application which will accept whatever input is needed for the navigation through the legacy application, and then use the captive terminal emulator behind the scenes to log into the application, navigate to the screens of interest, and capture the fields of interest. For Java developers (depending on what you’ve asked for), OpenLegacy also generates front-end web/Java code to use this application to accept input and return output using a number of mobile and web protocols, including SOA, HTTP GET/POST, or REST/JSON, making the legacy application immediately accessible to a wide range of modern devices. 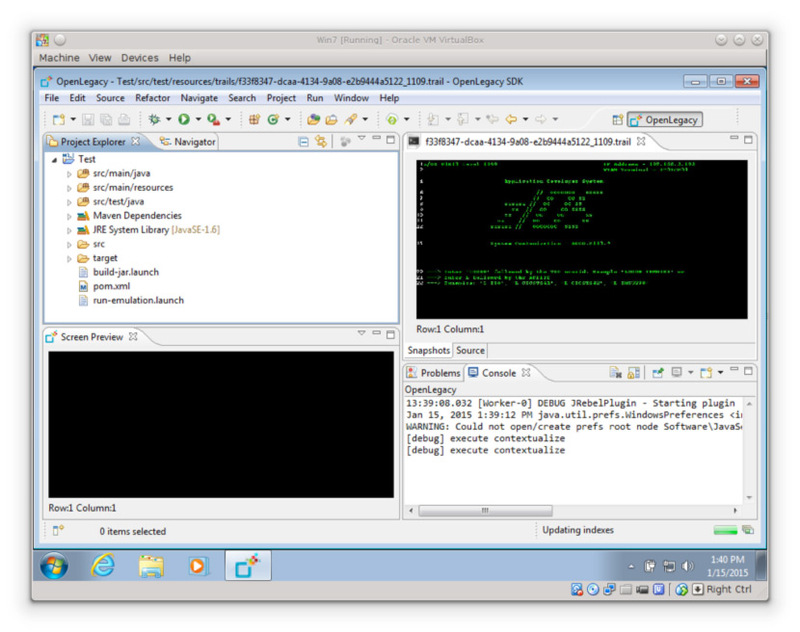 Once compiled and exposed to the client community via a servlet container, these web/mobile applications accept requests in the specified input protocol, extract the input argument data, call the core Java code to drive the legacy application filling in fields and simulating keystrokes as needed, and collecting the desired output from screen fields as previously directed. The collected output is then formatted by the front-end application according to the requirements of the protocol involved, and returned as a response. Your device has no idea that it is interacting with a 3270 application, and your 3270 application has no idea that it is interacting with anything other than a 3270 terminal. Oh, and did I mention that the Eclipse container includes a servlet container, and (since it was designed to allow developers to write/generate code and immediately compile and test it) a few additional mouse-clicks compile the generated code, create JARs and WARs and deploy them to that servlet container ? The result is that in as little as an hour from starting this process, you can be interfacing to your legacy application from your phone for testing. All you need is someone who knows how to navigate the legacy application and someone who knows how to navigate the OpenLegacy Eclipse GUI–two completely separate skill sets. Regardless of what you are considering for the future for your legacy applications, OpenLegacy provides an immediate way to vastly increase your client population without touching a line of legacy code. If this just seems like screen-scraping to you, look more closely. The differentiator here is the transparent creation of those front-end interfaces with no need for you to understand those technologies. Development using OpenLegacy doesn’t require you to know anything other than how to use the existing application. In future posts, I’ll discuss other ways to access legacy applications using OpenLegacy via mainframe protocols that bypass 3270 emulation.